I recently caught up with Monsters & Martians International Science Fiction Film Festival director Nadia Sandhu to discuss the upcoming fest – the first of its kind in Canada – and the state of science fiction as we head into another jam packed holiday season at the box office. Monsters and Martians runs at the Projection Booth in Toronto from Thursday, December 6th, up to and including Sunday, December 9th. Tickets and more info. If you are going to launch Canada’s first all science fiction film festival, you need to have a memorable name and this one evolved from a popular Saturday night series we ran at Projection Booth earlier this year. In fact, we hosted an Earth Day Party which featured Gozilla vs the Smog Monster and Turkish Star Wars on May the 4th Be With You under this banner. Star Wars Episode VII. How does that make you feel? I am a Star Wars nut but the recent 3D re-release of the Phantom Menace made me realize that you can love something to distraction but one day love just dies. I feel like Rhett Butler at the end of Gone With the Wind. I’m just so drained. If I may be so bold, however, I am disappointed that we are finally getting Episode VII now that Luke and Leia need walkers and Han is the in the retirement home. I truly dread the obligatory Luke becomes Ben Kenobi in a sacrifice scene. At this point I’d rather see a reboot of the prequel trilogy. Yes, a reboot. With a real story and real conflict, and a badass Anakin Skywalker and writers who actually have a clue how the story ends. And Ben doesn’t know about there being TWINS dammit. What do you think about The Hobbit in 48fps? Dear God. I cannot with another digital vs 35mm debate. What I can tell you is that I fully intend to see this film on opening night for the Man of Steel trailer and the first nine minutes of Star Trek: Into the Darkness. I can’t promise I will stay for the film because try as I might I just can’t seem to make myself care about it. Odd when you consider I met an ex-boyfriend because of my enthusiasm for a just about to be released Return of the King. As Festival Director, did you get time to make programming suggestions or was that left to Head Programmer Gareth McGorman? I really wanted to break the mold and showcase a web series rather than host the obligatory shorts showcase, ergo Heroes of the North on Sunday afternoon. Having something of a Super Hero fetish, and having worked with Jason Mewes, I was hot to trot on the first SModcast release “Alter Egos” which pairs really well with our web series for a Super Sunday Afternoon at the movies. Name a hidden sci fi film gem. Starman starring Jeff Bridges. Go see it. I dare you not to get teary at the end. Full disclosure: I am Nadia Sandhu, Festival Director and Co-Founder of Monsters & Martians and owner of Projection Booth Cinemas. 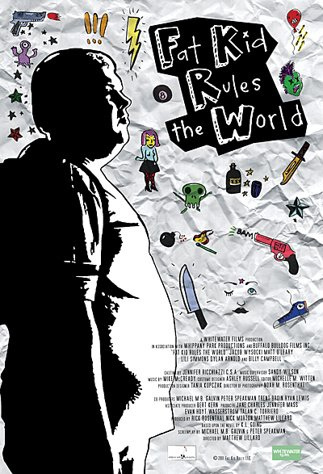 Fat Kid Rules the World introduces us to Troy Billings (Wysocki), the titular Fat Kid of the title, a depressed overweight teen who invisibly walks the halls at school as he’s ignored at every turn. Troy is depressed and lonely, especially after the passing of his mother, and decides to attempt stepping in front of a bus one day only to be saved by Marcus (O`Leary). Marcus is an unreliable musician who was expelled from the same high school Troy attends yet sneaks back in on a regular basis as he’s revered there because of his talent. Marcus convinces Troy that they need to start a new band, despite the fact that Troy can’t play, and starts him playing the drums. Meanwhile Troy’s home life is going no better as his father (Campbell) is an ex-military man who runs the lives of his sons as if they are enlisted men while Troy’s brother Dayle (Arnold) constantly tries to impress his father for whatever affection he can get. Troy’s insulated world of school and computer role-playing games is blown open by Marcus’ world of punk rock and chaos. Troy becomes submerged in the music and the drums. Seeing his son finally showing interest in something prompts his father to go out and buy a drum kit and encourage his dream all while trying to reason with Marcus who he rightly sees as a destructive force. At a concert Troy meets Isabel (Simmons) a beautiful punk girl, the type he only talks to in his elaborate fantasies, and the two strike up a friendship (no it’s not an awkward guy gets the girl type movie) but is left in the lurch as the unreliable Marcus leaves him behind in favor of a skanky girl. Troy continues coming out of his shell as the troubles with Marcus mount until the triumphant conclusion. Fat Kid Rules the World is a little gem of a film. It’s the type of film you discover, maybe through accident, that you can’t wait to share with everyone you know. Wysocki is a true discovery as he deftly manages to portray Troy as a trusting, warm-hearted individual who is also a bag of raw untapped emotions just under the surface. Wysocki’s performance, the ever beating heart of the film, is truly engaging throughout the entire film. O’Leary does some fine work here as the troubled Marcus who can never seem to not self-destruct and apparently has no desire to stop. This may be the best thing Campbell has done in years, his performance as the protective father is pitch perfect. Lillard may have discovered his true calling here as he shows a deft hand behind the lens and shows a lot of talent as a storyteller, I’m really looking forward to what stories Lillard may have to tell us next. Fat Kid does indeed Rule the World and can state it as a definite recommend. Fat Kid started its exclusive engagement at the Projection Booth Theater on Gerrard Street this weekend and continues all week long. The next installment of Little Terrors is tomorrow night, 8pm at the Projection Booth (1035 Gerrard East – take the College street car) in Toronto. 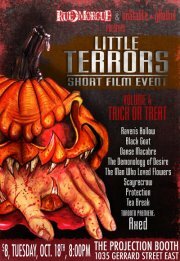 Little Terrors is a two hour viewing of some of the coolest and scariest short films out there. 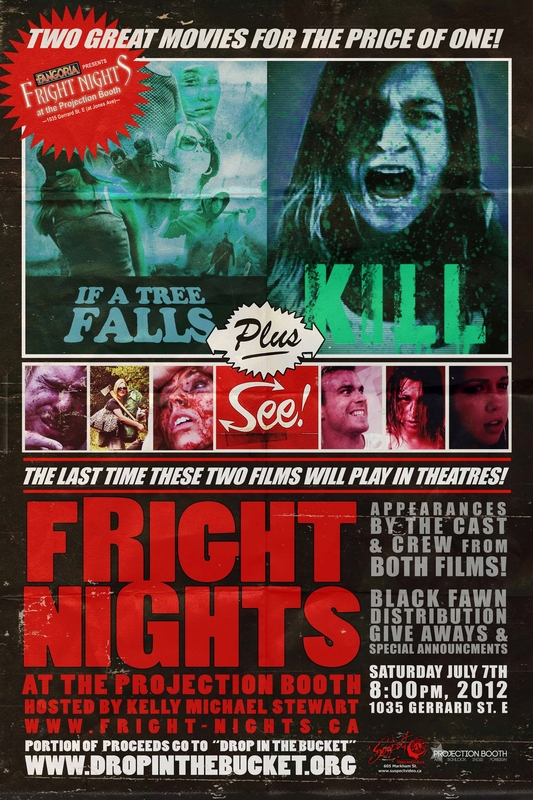 Tomorrow night will be the Toronto premiere of Axed which is going to be bloody as hell! If you aren’t sure about coming, just check out the review of Little Terrors volume 3 by Entertainment Maven guest blogger, Phil Graves. He’s a little rough around the edges, but he’s cheap. During these hard times, this is an acceptable combination.